Ragstone was an extremely important building material from Roman times. Its use and exploitation is culturally very significant in southeast England, yet old quarries have been almost completely destroyed and any new ones are immediately backfilled. Therefore, Ditton Court Quarry with its good access and long quarry faces is an excellent educational site. The site would be useful for multi-disciplinary field studies including sedimentology, stratigraphy, palaeontology, geography, environmental earth sciences and aspects of industrial archaeology. This is a very good exposure of Kentish Ragstone and Hassock facies in a near perfect setting for educational trips for all age groups. 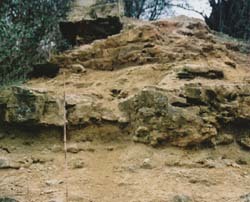 The outcrops are also suitable for study by amateur and professional geologists. The main face allows study of vertical and lateral facies changes. There are good erosive bases to many of the hard rag bands. The facies are extremely glauconitic with some horizons of silicification. 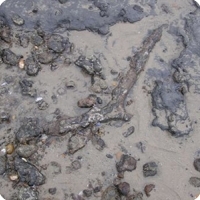 Shell debris (ammonites, belemnites, nautiloids, bivalves, etc.) and bioturbation are common. The outcrops could be important for future research work such as gamma ray profiling and interpretation of the alternating bedding in terms of climatic/eustatic changes. Access is very good. Park in the Community Centre car park and cross the playing fields to the abandoned quarry. Numerous paths and tracks, with occasional steps, cross the site. The old quarry faces are generally stable.